I haven't seen "My Little Ponies" in ages. However, Lewie loves "Peppa Pig" and "Olivia" on Nick Junior. He also told me he wants to be Sandy Cheeks the Squirrel from "Sponge Bob" for Halloween. I'll take this any day over him wanting to be an evil villain. In my book, any show that delivers a good message, like "My Little Ponies," gets an A+ from me. I did not realize John Delanci, the voice of discord, helped with the documentary. He's one of my favorite actors from, of course, Star Trek. Pretty funny. My kids loved them and we often went to garage sales to find the figurines. I have quite a few and have got my grandkids started with them. how very cute! bronies - that's pretty cool. I agree 100% in young people watching the decent, good message stories rather than out on the street, burning something down, or shooting someone. You are a wise parent. 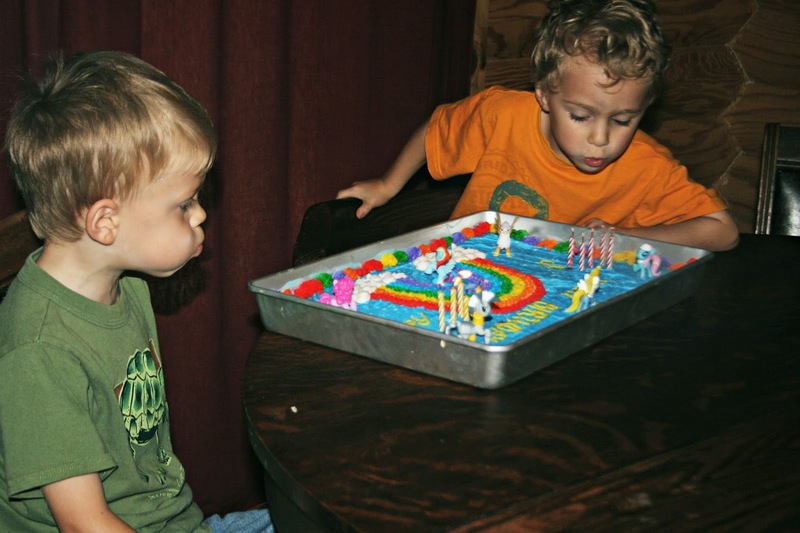 You did a great job on the cake/cookie - it's adorable and even though this is probably a phase the boys are going through, they'll always remember Mom doing this for them. Anything with animals and themes about harmony sounds good to me! And good for you and Paul for not getting caught up in gender stereotypes. I have seen the My Little Pony figurines, but I've never seen any of the movies. A that cake turned out fabulously! First of all the cookie cake is adorable! This was so interesting to read. I had no idea that adults were into My Little Pony, boys too and that they actually had clubs and Bronycon. My daughter was born just when the pony's came on the market so I really know nothing about them. I think I'm gong to have to watch it! Welcome back to my old friends!! Ella has been in love with them for years! In fact, we were out shopping with her once and Family dollar had several on sale. I let her choose one and bought it for her. Afterwards I was warned by her mother do NOT buy her any more! They use them as bribes to get her to do things! I totally agree with you I think more boys should play with them. 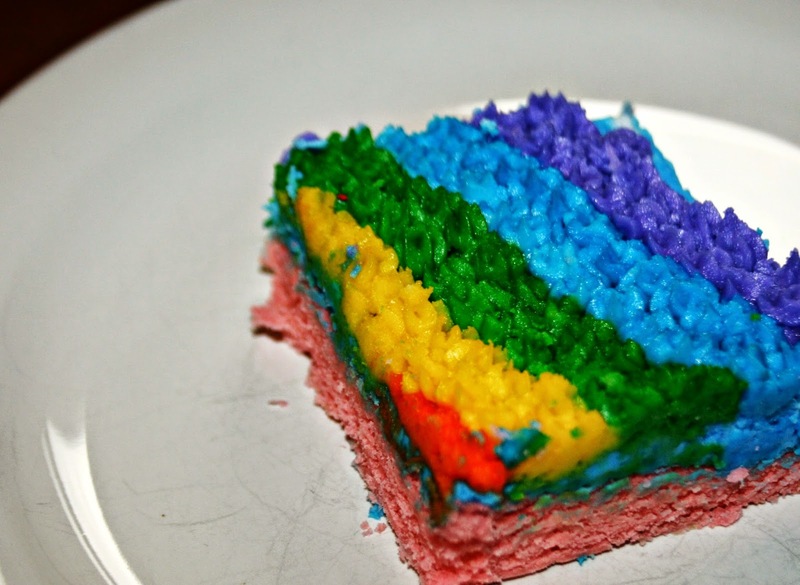 Your cake is awesome, I truly mean it! It looks better than any bought cake would have. I've posted about this--the two guys in the cubes behind me talk about the Ponies all the time. Of course, they have kids who watch it, but they like them too. I actually bought one of them Brony pajama pants. They have them in the men's department at Target. Go look for them. 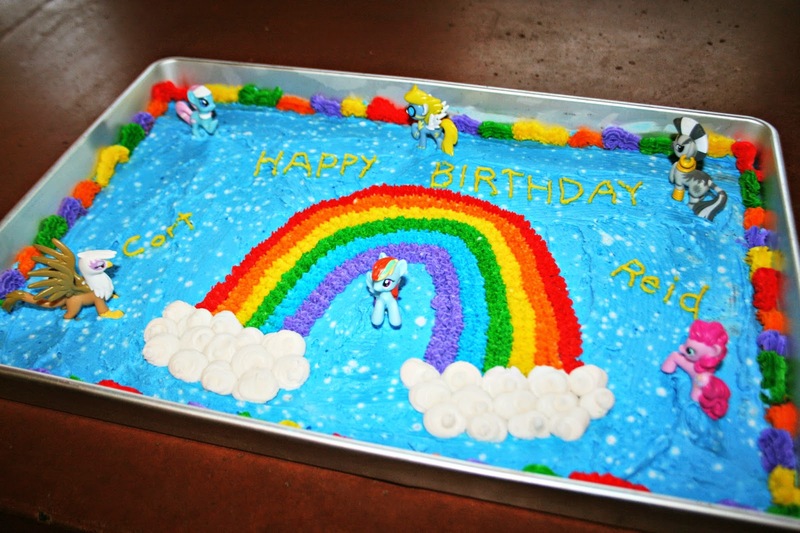 From what I am gathering, I think some of the bronies are not into the ponies as innocently as we might think. It's a fetish for some....so...uh...there's the reality to why there are haters. My daughter loved My Little Pony! Your cake is the "Bomb!" Wonder what is it in our society which 'tells' men that they can't enjoy shows about friendship and love--or even something which is geared for kids???? It's like the expression that "Men don't CRY".... Good Gosh--why not. The most macho man I know (My hubby) loves watching chick flicks with me ---and he can watch something sweet and sentemental and get teary... Gosh---I'm happy that people love "My Little Ponies".... That's NEAT. I've never seen it but am all for something that's G rated and teaches good lessons! Ponies are fun! And you are a great mom! That's so funny, and great that they like that. My nephews got into Care Bear. I love the cake! 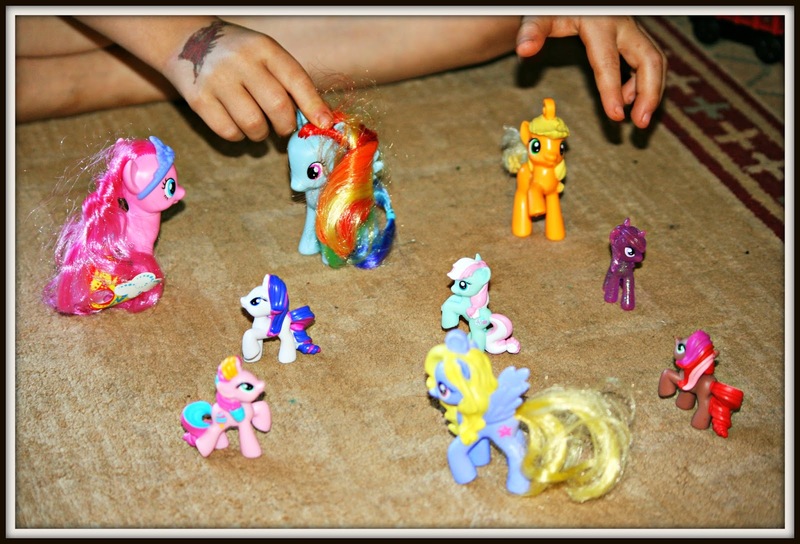 My daughter collected little ponies when she was a child, and there are still a bunch of them in a special foot locker in the barn. In the 1980's Little Ponies were definitely for girls only. Like dolls. I would like one of those ponys too!